MARIA STEIN — Dave DeVelvis accepted the first case of Shelby 1819 Limited beer produced by Moeller Beer Barn late Thursday afternoon. He also accepted a check in the amount of $250 in prize money from Shelby County Bicentennial Beer Subcommittee Chair Tony Bornhorst. Although the beer was canned Monday afternoon, just prior to the opening ceremonies for Shelby County’s Bicentennial celebration, DeVelvis and his wife, Linda, were still on their way back to Shelby County from Florida. As a result, the presentation was delayed. Moeller Brew Barn canned 100 cases of beer. The beer will be available locally at outlets served by Bobby Fisher Distributing. It has been available at The Bridge restaurant in Sidney since Monday. Sales there were reported to be brisk, where it is on tap. Their initial supply has already been replenished. County Commissioner Bob Guillozet and Shelby County Bicentennial Committee co-chair agreed. “Given the fact that Nick’s never brewed a pilsner before, I can’t believe that his first attempt was a home run. This beer is really great,” said Barhorst. First, of course, he’ll have a case of beer to drink before he has to buy any. In fact, he had Nick Moeller sign one of the six-packs for him. The art on the outside of the cans was designed by Creative Marketing Strategies President Mary Beth Monnier. The beer has an alcohol content of 4.7 percent. 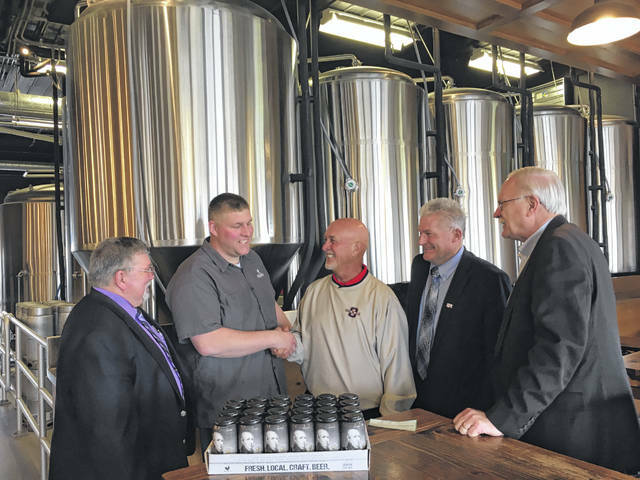 The beer is intended to be available only during Shelby County’s Bicentennial. A complete list of outlets where the beer will be available will be printed once it has been distributed.